This is also expected to save cost and time. The banten of ngaben and memukur are so complicated, and without clear reasons back ground, various symbols are also made from the small tower, music instruments, symbol of the ancestor, real tower, symbol of the dead, and dozens of symbols. All of these objects need banten for symbolically bring to life, purification, and put them dead again. At the village where direct cremating of the corpse is permitted, still symbol of the dead is made. At the highland areas where cremating the corpse is not permitted, they cremating the symbols. The symbol is given a complicated process again. 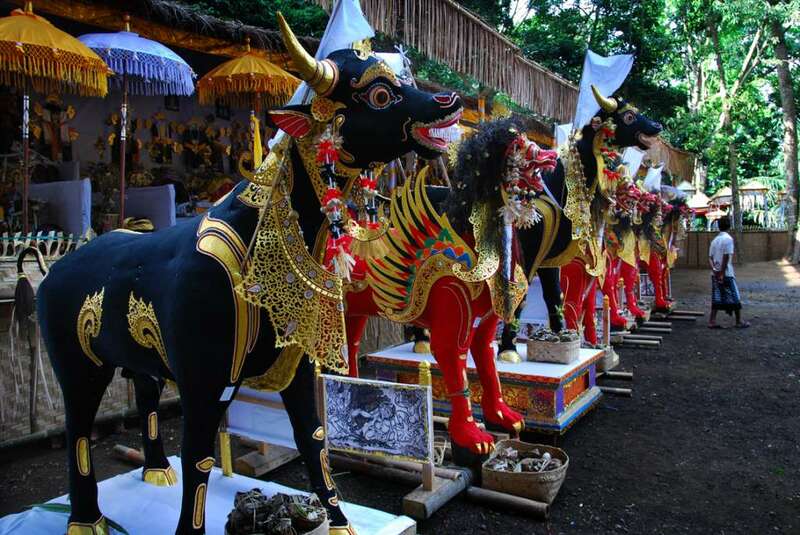 It is brought to the cemetery, as if the symbol is united with the body of the dead with various type of banten, then brought to the ngaben pavilion to get daily banten until the departure again to the cemetery. On the day already fixed all these symbols again brought to the cemetery with tower then cremated at the cemetery and the ash were brought to the river with various bantens, while new symbols appear again to be put on the memukur pavilion. Until the day that will be determined this symbols again cremated and the ash put in young coconut which later will be thrown to the sea. Indeed this process is followed again by a complex banten. Most of the ngaben during a trip to Gowa Laway to perform a ceremony of memukur with dozens of banten types, then visited Gowa Lawah, Besakih, Pura Dalem Puri, Goa, and to the house of the Brahmana ( Griya ) then back to the village. Again in the village a ceremony of enthroning like a god. This is not yet finish in total but still some ceremony with banten to symbolically cleaning the whole village from all superstitious dirts after the big ngaben and memukur rituals. An under developed villages in Bali can work for months to complete all this ceremonies and not rare after the ritual a family drained out of wealth, sickness, or even quarrelling with relatives. This view only for a general type of the ceremony, and variations can be found throughout the island.